We all know the upsides to enjoying sun-soaked summer days, however the warm weather can play havoc with our hair. While sun, sea and swimming pools might be the perfect formula for fun, the combination can spell disaster for locks if we don’t have a healthy hair regime in place for the season ahead. With the summer months playing host to more weddings and occasions than any other, not to mention snap happy moments like holidays and festivals, it is key to have a hair health strategy at the ready, and sooner rather than later. What’s the answer? Take Viviscal now for a summer free from haircare woes. When it comes to getting hair ready for summer, Viviscal believes the best defence is a good offence. 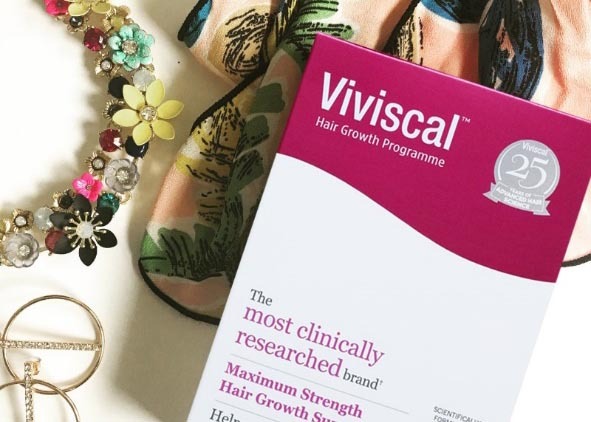 Being proactive and beginning to take Viviscal Maximum Strength Supplements in the springtime will help hair look its best as the summer gets in full swing. Viviscal supplements, which contain the marine protein complex Amino Mar C™, supply vital nutrients, including a unique blend of vitamins and minerals, to nourish the hair from within. Taking the supplement twice a day ensures existing hair growth is encouraged, making hair feel stronger and looking vibrant. Viviscal will lay the foundations for stunning summer tresses, as a good regime is key to protection against the elements. If your hair has prolonged exposure to the sun, UVA and UVB rays can damage the outside cover of the hair strand, called the cuticle. Spritzing a hydrating spray laced with UV filters will fend off damage but covering with a hat will do the trick too. Why not try Viviscal Densifying Shampoo, which gently cleanses leaving hair looking naturally thicker, fuller and gorgeous. It contains the Ana:Tel™ proprietary complex blended with Biotin, Keratin and Zinc to promote the appearance of healthy looking hair growth. Pair with Viviscal Densifying Conditioner for the perfect summer look. The risks to hair don’t stop with sun exposure, frolicking in the water can also result in damage. Saltwater is osmotic, drawing water molecules out of hair, while chlorine’s oxidising effect can leave strands brittle, dry and prone to breakage. But there is no need to avoid splashing around this summer, simply take time to apply a nourishing hair treatment afterwards or Viviscal Densifying Elixir. Help the process along by avoiding using heat on the hair. Ditching hot tools and adopting updos such as cool fishtail braids or sleek buns will make sure the new growth fostered by Viviscal is protected.